To summarize the past year, we can say with confidence that it was one of the most critical so far for the evolution of mobile threats. First of all, this was because of the steady growth in the number of malicious programs targeting mobile devices. 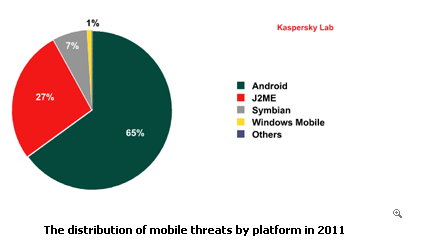 Second, because malicious users moved to Android as their main targeted platform. Finally, because 2011 was the year in which malicious users essentially automated the production and proliferation of mobile threats. Interest in Android OS will continue to rise among mobile virus writers, whose efforts will be focused primarily on creating malicious programs that target this specific platform. A rise in the number of attacks using vulnerabilities. Today, exploits are used only to obtain root access on a smartphone, but in 2012 we can expect the first attacks where exploits are used to infect the mobile operating system. An increase in the number of incidents involving malicious programs found in official app stores, primarily Android Market. The first mass worms for Android. The spread of mobile espionage.